Image, right: A junior business advisor for TechnoServe discusses farming techniques with a Ugandan farmer. Technoserve is the NGO receiving the most funds from the Gates Foundation. It’s a US based NGO that develops “business solutions to poverty”. Running on an $80 million annual budget, it received a total of $85 million from the Gates Foundation during the last decade. Over half of these funds came through a 2007 grant “to help entrepreneurial men and women in poor rural areas of the developing world build business”. 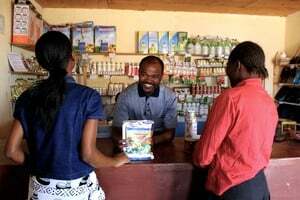 Technoserve carries out this work through partnerships with food corporations such as Cargill, Unilever, Coca Cola and Nestlé, who bring “world-class business and industry expertise” and who are offered, through the programme, “new market and sourcing opportunities”. Does the Gates Foundation use its money to tell African governments what to do? Not directly. The Gates Foundation set up the Alliance for a Green Revolution in Africa in 2006 and has supported it with $414 million since then. It holds two seats on the Alliance’s board and describes it as the “African face and voice for our work”7. A project evaluation report states that 44% of the agro-dealers in the programme were providing extension services. According to the World Bank: “The agro-dealers have… become the most important extension nodes for the rural poor… A new form of private sector driven extension system is emerging in these countries.”The agro-dealer project in Malawi has been implemented by CNFA, a US-based organisation funded by the Gates Foundation, USAID and DFID, and its local affiliate the Rural Market Development Trust (RUMARK), whose trustees include four seed and chemical suppliers: Monsanto, SeedCo, Farmers World and Farmers Association. Adapted from “The Hunger Games” by War on Want, London, 2012. Listening to someone, if it has any real significance, should also include the intent to learn. But nowhere in the programmes funded by the Gates Foundation is there any indication that it believes that Africa’s small farmers have anything to teach, that they have anything to contribute to research, development and policy agendas. The continent’s farmers are always cast as the recipients, the consumers of knowledge and technology from others. In practice, the foundation’s first guiding principle appears to be a marketing exercise to sell its technologies to farmers. In that, it looks, not surprisingly, a lot like Microsoft. GRAIN would like to thank Camila Oda Montecinos for her help in pulling together the database and the graphic materials. In 2007, the Los Angeles Times revealed that hundreds of Gates Foundation investments – totalling at least $8.7 billion, or 41% of its assets – were in companies that ran counter to the foundation’s charitable goals or social philosophy. CGIAR 720 The CGIAR is a consortium of 15 international research centres set up to promote the Green Revolution across the world. Gates is now amongst its major donors. 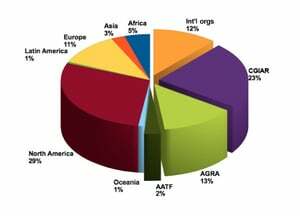 Main recipients include: IFPRI ($167 million), CIMMYT ($132m), IRRI ($139m), ICRISAT ($76m), IITA ($49m), ILRI ($15m), CIP ($55m), CIAT ($33m) and others. Most of the grants are in the form of project support to each of the centres, and many of them are focussing on developing new crop varieties. AGRA 414 A total of 14 grants for core support and AGRA’s main issue areas: seeds, soils, markets, and lobbying African governments to change policies and legislation. Int’l orgs (UN, World Bank, etc.) 362 World Bank – IBRD ($119m); World Food Programme (WFP) ($79m); UNDP ($54m. ); FAO ($50 m.) UN Foundation ($30m). The lion’s share of the grants to the World Bank are to promote public and private sector investment in agriculture ($60m), WFP is supported to improve market opportunities for small farmers, UNDP to establish rural agro-enterprises in West Africa, and the support to FAO is mostly for statistical and policy work. AATF 95 AATF (African Agricultural Technology Foundation) is a blatantly pro-GMO pro-corporate research outfit based in Nairobi. Gates supported them with almost $100 m mostly to develop and distribute hybrid maize and rice varieties, but also to raise“awareness on agricultural biotechnology for improved understanding and appreciation”. Universities & National Research Centres. 678 Over three quarters of all Gates funding to universities and research centres goes to institutions in the US and Europe, such as Cornell, Michigan and Harvard in the US, and Cambridge and Greenwich Universities in the UK, amongst many others. 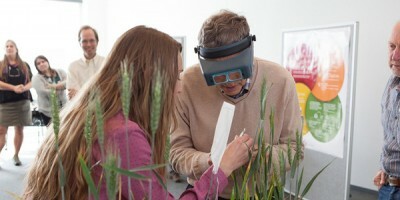 The work supported is a mix of basic agronomic, breeding and molecular research, as well as policy research. A lot of it includes genetic engineering. Michigan State University, for example, got $13m to help African policy makers “to make informed decisions on how to use biotechnology”.Although most of the foundation’s grants are supposed to benefit Africa, barely 12% of its grants to universities and research centres go directly to African institutions ($80m in total, of which $30m for the Uganda based Regional University Forum set up by the Rockefeller Foundation. Service delivery NGOs 669 The Gates Foundation sees these as agents to implement its work on the ground. 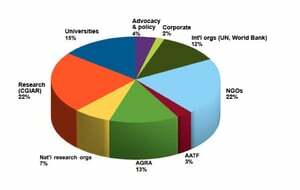 They include both large development NGOs and foundations, and the activities supported tend to have a strong technology development angle, or focus on policy and education work in line with the foundation’s philosophy. A whopping 76% of these grants end up with beneficiaries in the US, and another 13% in Europe. African NGOs get 4% of the NGO grants ($28m total, $13m of which to groups in South Africa, and another $13m for “Farm Concern International” an NGO based in Nairobi with the mission of creating “commercialized smallholder communities with increased incomes for improved, stabilized & sustainable livelihoods in Africa and beyond”. Corporations 50 A relatively minor share of Gates’ funding goes directly to the corporate sector. Most of the grants are for specific technologies developed by the corporations in question. The two single largest grants ($23m and $9m) are to the World Cocoa Foundation, a corporate outfit representing the worlds major food and cocoa processors, for (amongst other things) “grants to industry players who will focus on improving the productivity of cocoa”. Advocacy & policy 122 Here we find a mix of groups working on policy issues to support the Gates Foundation’s agenda, especially in Africa. The two largest grants are for the Meridian Institute in the USA, ($20m) to “develop an Africa-based and Africa-led partnership” and to FANRPAN, a policy research network based in South Africa ($16m) to set up “nutrition sensitive agriculture programs” in sub-Saharan Africa.Please note that much of the foundation’s policy and advocacy work is implemented through grants to institutions in the other groups (such as Universities, the CGIAR and, most notably, AGRA), to get African policy makers to change seed, land, IPR and other laws to favour corporate investment and technology introduction. USA 880 By far the largest recipient country of Gates agricultural grants meant to benefit farmers in poor countries: $880 million dished out in 254 grants. Recipients include US universities and research institutions to produce for crop varieties and biotechnology research for farmers in Africa (e.g. Cornell University, $90m in 12 grants), big NGO projects mostly oriented to develop technology and markets (e.g. Heifer, $51m, to increase cow productivity and Technoserve Inc., $47m, to help poor farmers to “build business that create income”), and several policy and capacity building projects to push the foundation’s agenda in Africa and elsewhere. UK 156 A total of 25 grants with a focus on academic research such as for the University of Greenwich to work on cassava value chains in several African countries (16.6 m), the University of Cambridge to work on epidemiological modelling on wheat and cassava diseases ($4.2m) and the John Innes Centre to test the feasibility cereal crops capable of fixing nitrogen ($9.8m). Germany 115 Three grants for the German Federal Enterprise for International Cooperation (GIZ) to develop supply chains for African ca shews and for support to African rice farmers ($51.1m), and another three grants for the German Investment Corporation to work on African cotton and coffee farming ($48.8m), amongst others. China 37 Mostly for the Chinese Academy of Agricultural Sciences (two grants totalling $33 million) to develop new rice varieties for farmers across the world. South Africa 37 14 grants to a variety of grantees, including the FANRPANnetwork to carry out agriculture programmes ($16m), University of Pretoria ($4.5m for policy research) Sangonet ($1.7m. for mobile phone applications for farmers), SACAU (two grants $5.8m to support farmers organisations and electronic farmer management systems, and the Association of African Business Schools ($1.5m to develop agribusiness management and training programmes). Uganda 36 Mostly for RUFORUM (two grants totalling over $30 million to support agricultural research universities in the region). RUFORUM was established as a programme of the Rockefeller Foundation in 1992 and became an independent Regional University Forum in 2004. Australia 30 A total of 14 grants mostly to universities and research centres to develop sorghum and cowpea hybrids for Africa and other sorghum breeding programmes, deliver solutions to dairy cattle genetics in poor countries, and supply cattle genotypes to dairy farmers in East Africa, amongst others. Canada 20 A total of 8 grants mostly to universities to ensure adoption of new technologies, develop cassava seed supply chains in Tanzania, and radio programmes in Africa, amongst others. Total top 10 1413 $1.4 billion, or almost half of all agriculture funding from Gates in the last decade went to grantees in these 10 countries: 90% to the North. 1 Gates Foundation website, “Agricultural Development, strategic overview”. 2 Gates Foundation website, Foundation Fact Sheet. 3 We used the grants database on the Gates Foundation website and analysed the grants listed under ‘Agricultural Development’, 610 grants totalling US$ 3,110,591,382. (Database last accessed on 7 October 2014: http://tinyurl.com/m9s42z7). 4 Download the database as an Excel spreadsheet or as a more printer-friendly table (44 pages). 5 For a discussion on Gates and the CGIAR, see: SciDevNet, “Are Gates and CGIAR a good mix for Africa?”, 2010. 6 Several good critiques on AGRA already exist and we won’t repeat them here. See, for example, African Centre for Biosafety, “AGRA: laying the groundwork for the commercialisation of African agriculture” , by Food First, “Out of AGRA: the Green Revolution returns to Africa” (2008), GRAIN, “A new Green Revolution for Africa?” (2007) and others. 7 From the Gates Foundation’s Agricultural Development Strategy 2008-2011, quoted in Phil Bereano and Travis English, “Looking in a gift horse’s mouth”, in: Third World Resurgence, TWN, Penang, 2010. 10 Gates Foundation website, “Agricultural Development, strategic overview”. 11 Figures based on the foundation’s 2012 tax returns, as reported in Alex Park and Laeah Leet, “The Gates Foundation’s hypocritical investments”, Mother Jones, 6 December 2013. 12 Charles Piller, Edmund Sanders and Robyn Dixon, “Dark cloud over good works of Gates Foundation”, Los Angeles Times, 7 January 2007. 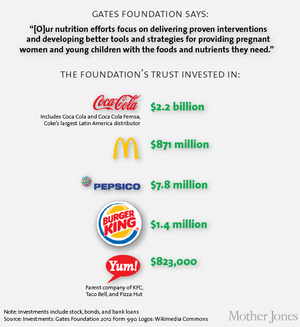 14 Figures based on the foundation’s 2012 tax returns, as reported in Park and Leet, “The Gates Foundation’s hypocritical investments”, Mother Jones, 6 December 2013. 15 John Vidal, “Why is the Gates foundation investing in GM giant Monsanto?” Guardian, 29 September 2010.